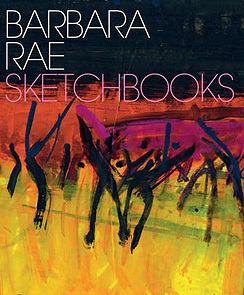 Whenever she is working outside Barbara Rae responds to what she sees in her sketchbooks. Published here for the first time, these dynamic studies provide themes and motifs for Rae's paintings and prints, but they also stand alone as sensuous evocations of the subjects to which she is so attached. Richard Cork draws on interviews with the artist to examine how she sketches to connect with a subject and he describes the experience of looking through the vibrant pages of the sketchbooks. The sketchbooks are introduced by Gareth Wardell and are thematically arranged to reflect Rae's particular interests. This hardback book has 148 pages with 150 illustrations and measures 29.5 x 25cm. Click here for purchasing details.. In this book, the first comprehensive study of Rae's prints, Andrew Lambirth charts her development as a printmaker, from her early experiments at Edinburgh College of Art to her recent collaboration with Coriander Studios. 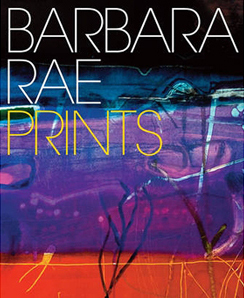 While the significant relationship with her painting is demonstrated, it is Rae's unwavering commitment to printmaking as an independent and important medium, and her continued experimentation with its methods and materials, that distinguish her work. Illustrated with key prints from throughout her career, this book celebrates the art of one of Britain's most gifted and original printmakers. The book contains 160 colour illustrations over 160 pages and is 29 x 24cm. 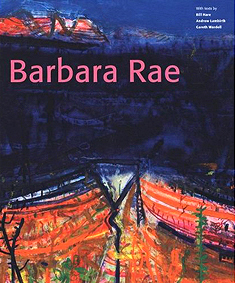 This is the first fully illustrated monograph of Barbara Rae's career to date. This book charts the development of her work alongside her journeys around the globe, and the chapters are divided topographically: from 'Ireland' and 'Spain' to 'Arizona' and 'South Africa'. The reader comes to an understanding of the importance of place in Rae's work - in particular, the human traces and patterns of history that are left on a landscape - and at the same time gains an insight into how the structure of a landscape is simply the starting point for an experimental studio process, involving paint, colour and collage, that borders on abstraction. Her 'pure pleasure of painting' is evident in the dynamic and experimental works shown. In an extensive interview by Andrew Lambirth, Rae reveals the fascinating secrets of what goes on in her studio, such as throwing buckets of water at her paintings and working on large scale pictures on the floor; letting them accumulate splatters as part of their 'life'. An essay by Bill Hare situates the work in its twentieth- and twenty-first-century contexts. The contribution of the authors combined with the lavish and extensive illustrations ensure that this book is an important and engaging homage to the life and work of this extraordinary painter. Containing over 170 colour plates, a foreword by Gareth Wardell, an interview with the artist by Andrew Lambirth and an essay by Bill Hare. 192 pages, 30 x 25.5cms.